Generally cloudy. Slight chance of a rain shower. High around 60F. Winds ESE at 5 to 10 mph..
Pastor Ben Austin points to some of the damage on the frames of the stained glass windows which were recently removed from the chancel of Grace Lutheran Church. The stained glass windows in the chancel of Grace Lutheran Church were recently removed because of deterioration of the frames. The window area temporarily has been covered with drywall. BROOKVILLE — A mystery more than 100 years old continues to perplex the congregation of Grace Lutheran Church in Brookville. The mystery is the name of the donor(s) of the large stained glass windows which, until a few days ago, were located behind the altar in the chancel of the church. Adding to the mystery is the date when the windows were placed in the church. “We have no idea where the window came from,” Pastor Ben Austin said. Referring to the early history of Brookville, he said, “This church was built on this hill, with nothing else. Right across the valley is Mr. Litch’s house. 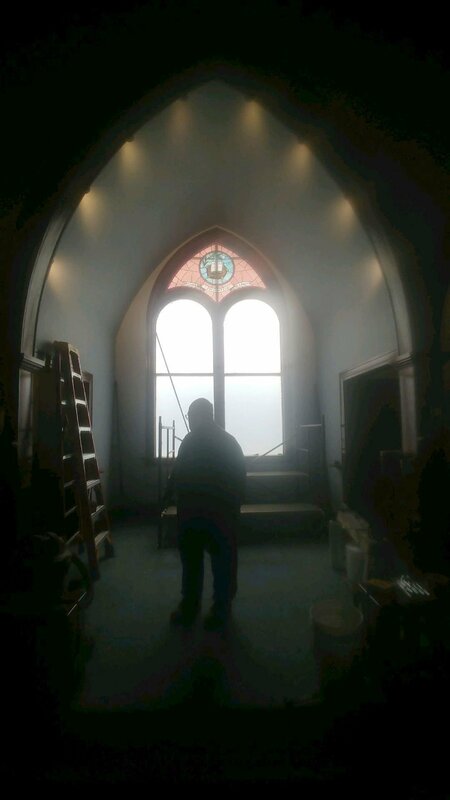 In one of the pictures Mr. Litch took of his lumber yard you can see the church” without the stained glass window. Austin said another feature of the window adds to the mystery. “What is really interesting about the window is that it has a Masonic Bible in it. The position of the Lutheran Church at that time was that you could not be a baptized Lutheran Christian and be a Mason because of their secret oaths,” he said. “We are not anti-Masonic as a parish, but where did this come from? “We have no clue. The two bottom windows, at the beginning, did they hang at the front of the church? The problem is, all pictures show clear glass. The stained glass windows on the sides point to the 1890s,” he said. “The other option, and we can’t substantiate it,” he said, “is did they come from St. John’s Lutheran Church Windy Hill? Did the teardrop hang in another church? It matches nothing, so it is an absolute mystery. Did someone have these lying around? The only other windows in town that I’ve seen like these are in the Baptist Church. Originally this church, St. John’s and St. Matthew’s (Green Valley) were part of a three-point parish, perfectly laid out in a triangle. “There is so much intrigue about this window,” he said. “It has been covered and uncovered five times.” First, a wall was built in front of it, against the altar. Then the wall was torn down. “It was open for a while, then they boarded it up again. Then they undid that and put a curtain over it. Then they boarded it back up again. Finally they took it off again and since the late 80s it was standing here, open,” he said. “Part of the problem was that when they put the plexiglass over it, they didn’t drill any holes, so it started to deteriorate. The windows were carefully removed and have been wrapped in plastic. Drywall is currently covering the wall in the chancel. Among the options being considered are restoring or copying the windows, “which is very expensive,” he said. “We have a stained glass committee that is reviewing other options. I trust this congregation. We have many brilliant minds and I know they will make good suggestions. I’m leaving it up to them. Cloudy skies. Slight chance of a rain shower. High around 60F. Winds ESE at 5 to 10 mph. Cloudy skies this evening will become partly cloudy after midnight. Slight chance of a rain shower. Low 47F. Winds SE at 10 to 15 mph. Mostly cloudy skies. High 74F. Winds SSE at 10 to 15 mph.